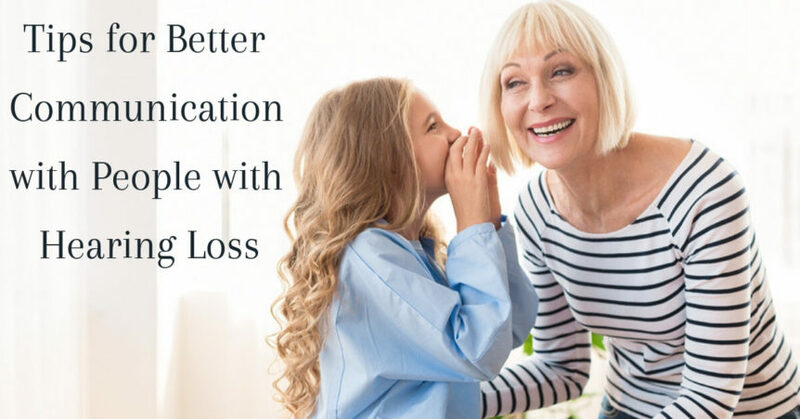 When you have family members, friends and colleagues who have hearing loss, you can make a few simple adjustments in how you communicate with them that can make things run much more smoothly than they otherwise would. Some people are very open about their hearing loss, and they will ask you to make adjustments to help during a conversation. However, you may notice that others either don’t realize they have hearing loss, are not ready to address it yet or maybe have hearing loss but don’t wear hearing aids. Even for individuals who do have hearing aids, these devices may not be functioning at their peak. Whether you suffer from hearing loss or are speaking to someone who does, conversations require a lot of focus, energy and patience. Focusing on hearing can be tiring, and people have an even more difficult time when they are tired, sick, anxious or in a bad mood. Follow these simple tips to improve communication with your friends, family and co-workers with hearing loss. Getting the listener’s attention before you start speaking will give them a moment to shift their attention and focus on you. Try saying the person’s name or using a gesture to get their attention to ensure that you are on the same page. Ensure that you are face to face before speaking to someone with hearing loss. Maintaining eye contact will help them focus on what you’re saying. Lip reading and facial expressions play a large part in communicating for both sides of the conversation. Speak clearly, at a normal or slightly slower speed and enunciate your words. Speaking in a slightly louder voice may also help your listener understand, but be careful not to shout. Shouting distorts the sound of your words and can make lip reading more difficult. Most listeners depend on lip reading and facial expressions to understand conversations more completely. Be sure not to cover your face and avoid exaggerated facial expressions that may distort your mouth and impede the listener’s ability to lip-read. If you find that you’re being asked to repeat yourself, try rephrasing and using different words to make your message easier to understand. Ask leading or clarifying questions throughout the conversation to ensure your message is clear. Background noise makes listening conditions difficult for those with hearing loss, try to avoid situations where there will be loud noises whenever possible. Turn off the television/radio, move away from noisy areas and if you’re in a social environment, try to find a quiet place to sit or a seat in a restaurant that is away from the kitchen or large gatherings. Many people who suffer from hearing loss tend to have one ear that is stronger than the other. Look for cues as to which ear that is, ask them if appropriate, and situate yourself on that side of your listener. Pay attention to your listener’s facial expressions and body language for signs of confusion or that they don’t understand. If you notice that they seem confused, tactfully ask if they understand or if they need clarification. If your listener communicates via an interpreter, be sure to keep your eyes on and speak directly to your listener and not the interpreter. It may seem odd at first, but the interpreter is a tool to help the listener communicate. You may feel understandably frustrated when interacting with a loved one with hearing less, especially if they ask you to repeat yourself frequently. Keep in mind how difficult it must be for them on a daily basis. Be patient. Communicating with hearing loss is a cooperative effort and requires understanding from both sides. Most importantly, every person with hearing loss has different communication needs. Don’t presume to know what strategies will be most effective to use with every person with hearing loss. By asking the person with hearing loss what you can do to help the communication flow more smoothly, you demonstrate respect and a willingness to take equal responsibility to make the communication work. Ask the person with hearing loss how you can modify your communication exchange to make it most effective. Are you struggling with conversations and speech recognition? Do you find yourself out of the loop at dinners or social events with friends and loved ones? It could be a hearing loss. Seeking treatment for hearing loss helps you reconnect with the sounds of your life. Contact us at Neighborhood Hearing Aid Center today to schedule an appointment for a hearing test!